even more foolish is the man who believes what he reads just because it is in the newspaper. The CNN effect is a theory in political science and media studies that postulates that the development of the popular 24-hour international television news channel known as Cable News Network, or CNN, had a major impact on the conduct of states’ foreign policy in the late Cold War period and that CNN and its subsequent industry competitors have had a similar impact in the post Cold War era. While the free press has, in its role as the “Fourth Estate,” always had an influence on policy-making in representative democracies, proponents of the CNN effect argue that the extent, depth, and speed of the new global media have created a new species of effects qualitatively different from those that preceded them historically. 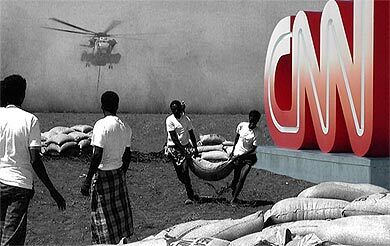 The term’s coinage reflects the pioneering role played by the network CNN in the field, whose “saturation coverage” of events like the Tiananmen Square protests of 1989, the fall of Communism in eastern Europe, the first Gulf War, and the Battle of Mogadishu was viewed as being strongly influential in bringing images and issues to the immediate forefront of American political consciousness and beyond. Despite these origins, the term as used generally refers to a broad range of real time modern media, and is not exclusive to CNN or even 24-hour news cycle broadcast cable news. By focusing instantaneous and ongoing media coverage on a particular conflict, international incident, or diplomatic initiative, the news cycle effectively demands political attention, as governing politicians attempt to demonstrate that they are “on top of” current issues. The effect has been, according to Margaret Belknap, that “[t]he advent of real time news coverage has led to immediate public awareness and scrutiny of strategic decisions and military operations as they unfold”. Deeper penetration and wider broadcast of statements and actions by public figures may increase transparency, but it can also complicate sensitive diplomatic relationships between states or force an official reaction from governments that would otherwise prefer to minimize political risk by remaining noncommittal. The information revolution and spread of global mass media through the Internet and international 24-hour news thus accelerates the policy-making process, requiring a faster tempo of decision and action to forestall the appearance of a leadership vacuum. The one thing it does, is to drive policymakers to have a policy position. I would have to articulate it very quickly. You are in real-time mode. You don’t have time to reflect. Time for reaction is compressed. Analysis and intelligence gathering is out.